*Disclaimer: This post contains an affiliate link. Any purchases made through these links will result in a small commission for me. 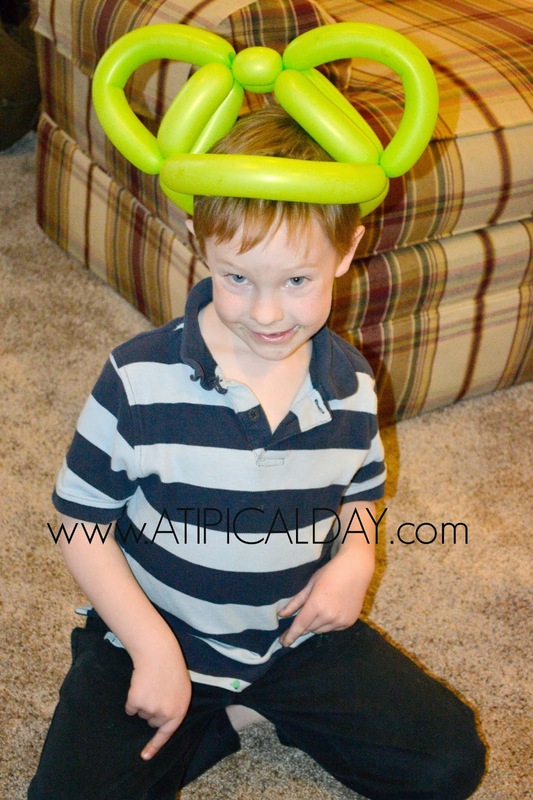 When Bud, my youngest son, came and asked me if he could have a birthday party I was a little hesitant. Aside from our schedule being jam packed, our budget is really tight. Did I really want to kill myself trying to throw something together? Then he told me he wanted to have a Mickey Mouse party and I knew I could probably pull it together for him. We quickly set to work tackling our most difficult obstacle...the date. Once we had that set, I headed online to try and find some cute and free invitations. I usually like to use Evite for our invitations. It makes tracking, reminding and communicating with guest really easy. As much as I like the creative process of a paper invitation, digital are so practical. I was disappointed to find that Evite no longer had any Disney themed invitations, so I headed over to Punchbowl and they had the perfect one! Both sites offer free invitations, my favorite kind! To help save money I asked some family members to bring some of the food. If you are on a tight budget this is a good way to go, and honestly most of the time people are happy to bring something! 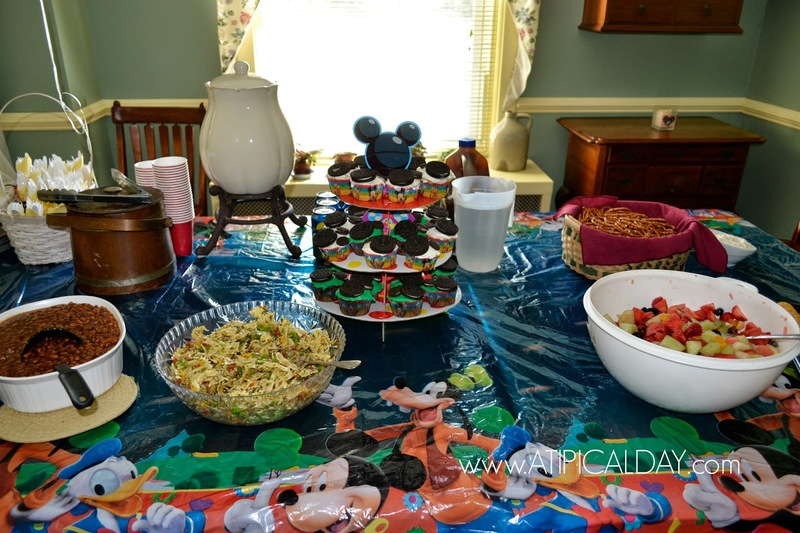 Both the tablecloth and the cupcake stand I recycled from a party I had had a few years earlier for one of my older boys. I am telling you, if you can reuse them, do it! You never know when it might come in handy! 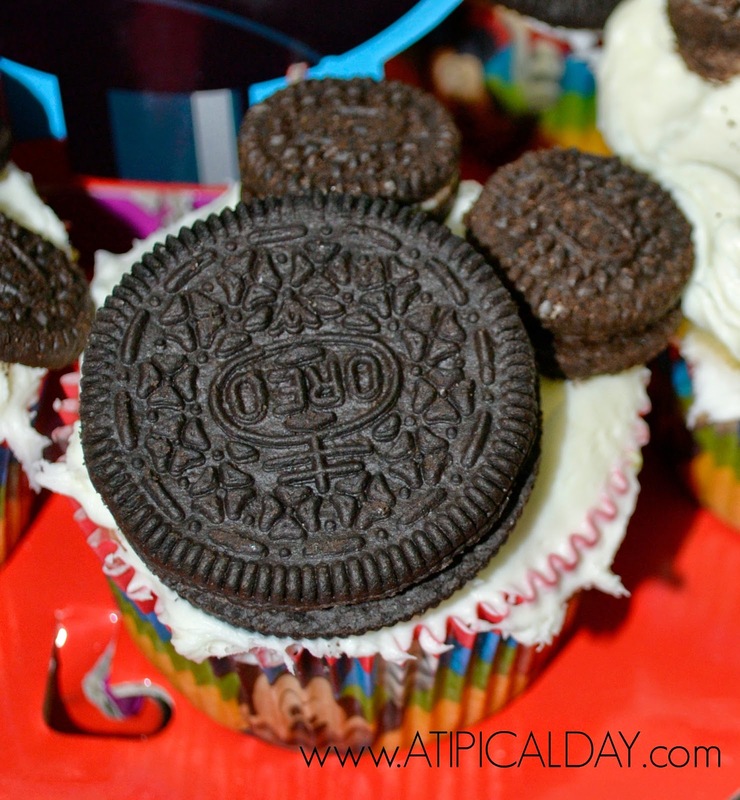 I wish I could take credit for these cute cupcakes, but I have seen several variations of them all over the web. I was pleased with how they turned out though and Bud loved the green icing. One thing I would note, especially if you are on a tight budget, is to buy a store brand cookie and break them apart. They will stretch twice as far, and probably look nicer since they will be more flat. I bought the napkins, cups and plates at the dollar store. I also picked up some Mickey Mylar balloons and black streamers while there. I had the cutlery already so no expense there. The dollar store does sell cutlery however and your can get it in different colors as well. 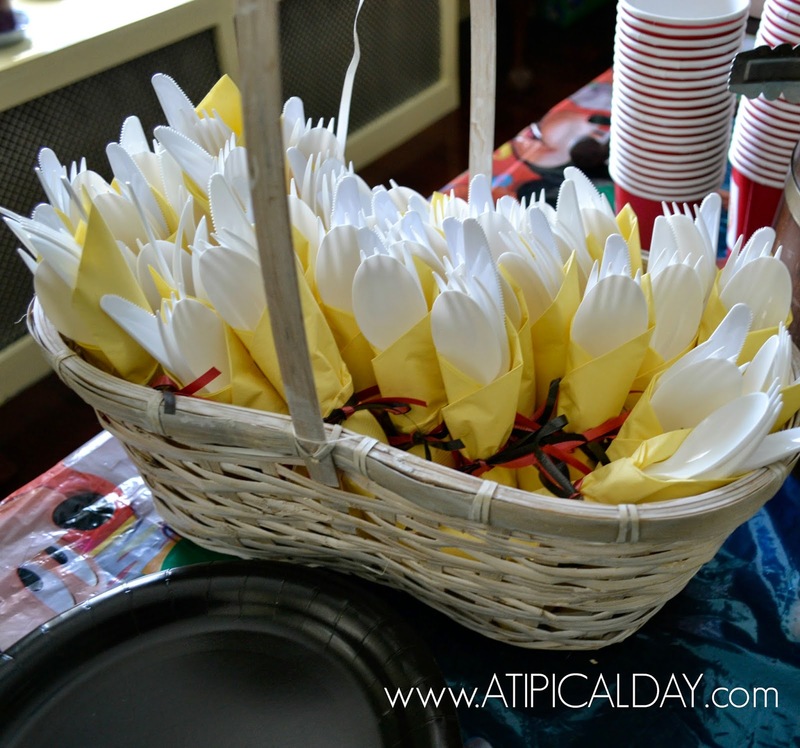 My boys helped me to wrap the silverware in a yellow napkin and tie with black and red curling ribbon. I put them all in a big basket and tied one of the Mickey balloons to it. 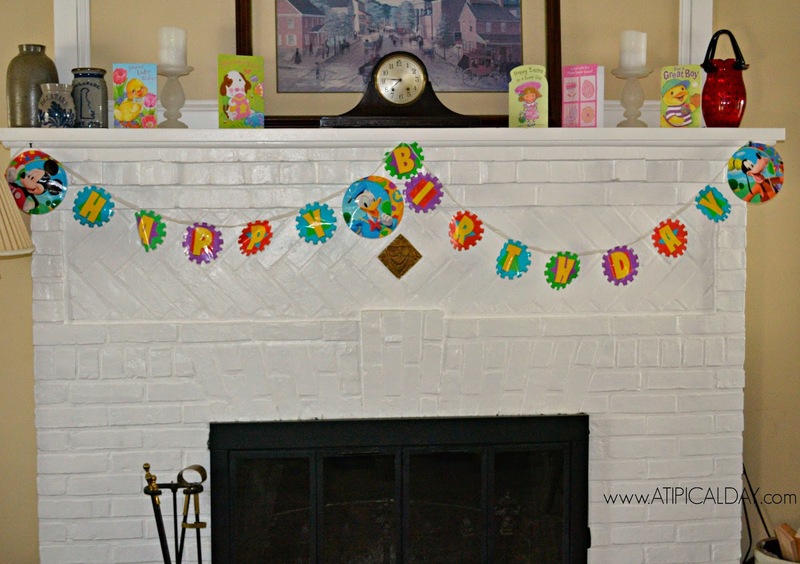 I downloaded some cute party printables from Play. Party. Pin.. Pumpkin helped by adding the Mickey Ears to all of the cups. 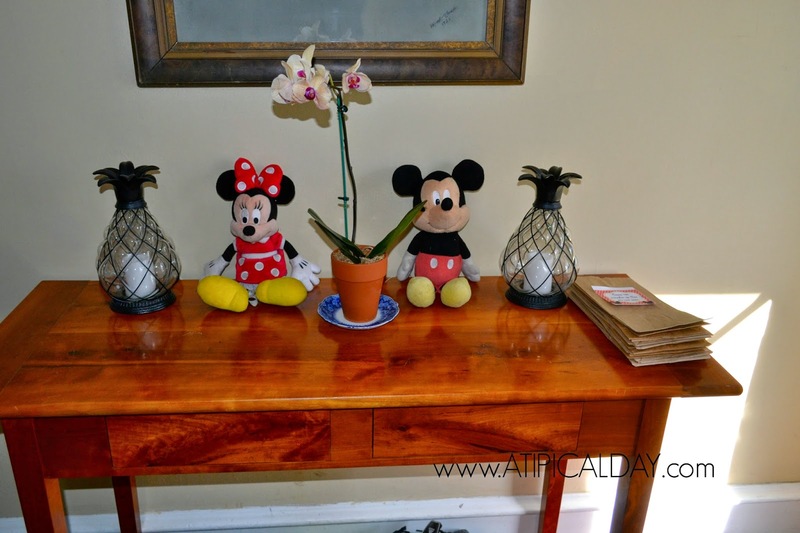 Using just a few Mickey & Minnie stuffed animals carefully placed around the house, we had a nice party atmosphere that didn't cost me a dime! 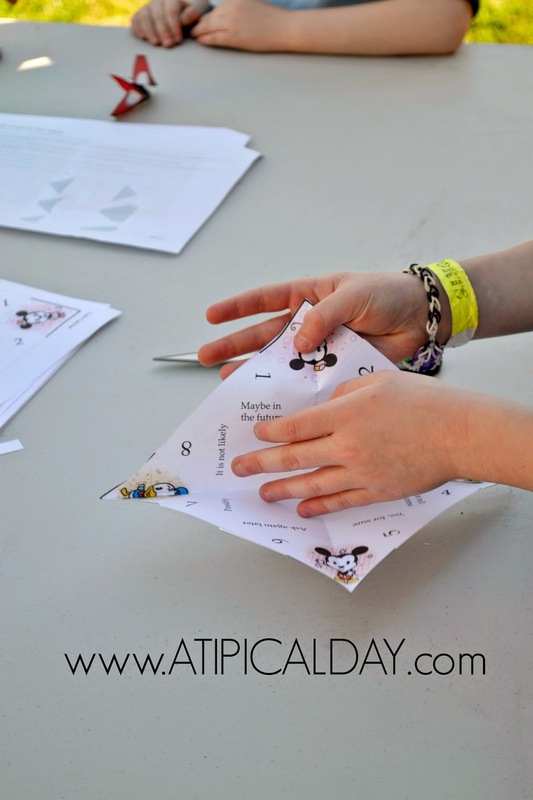 I used some more of the printables from Play. Party. 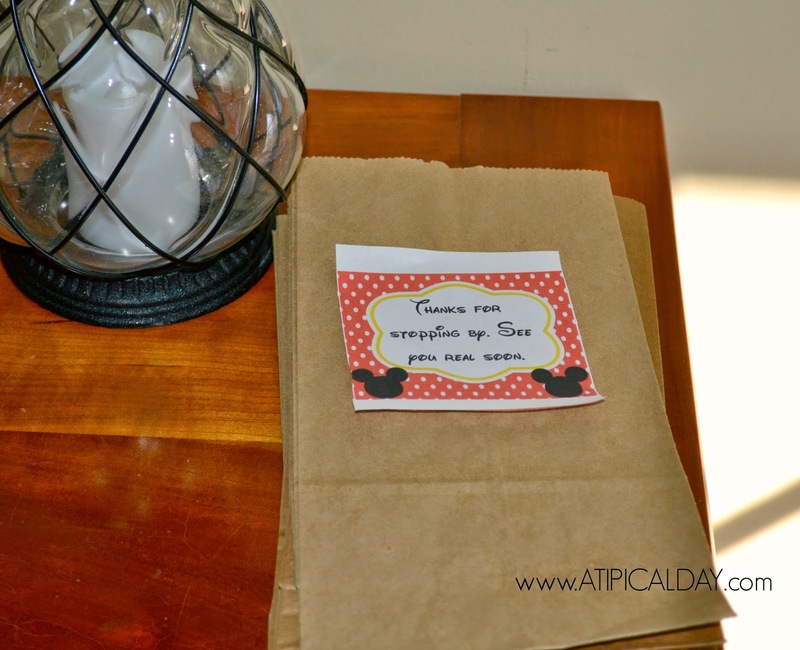 Pin., and made some goodie bags to use with the pinata. This is another place I saved money. I just used some lunch bags which I already had and printed the labels. Since we planned to be mostly outside, I didn't spend a lot of time decorating indoors, but I had this banner from a previous party so we hung it over our fireplace to make the living room more festive in case someone went in there. Moving outside, I had my laptop set up playing some Mickey Mouse Club House Music. It really did a lot for setting the mood! For the games we made a lot of stations. 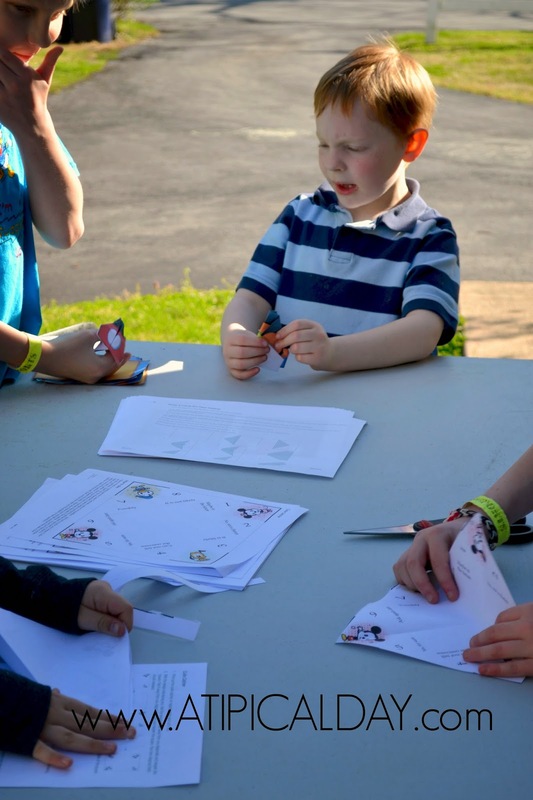 We had one table were the kids could make paper airplanes and cutie catchers. This was a hit with the older kids, but the younger ones didn't get into it so much. You can download both of these projects and more at Spoonful.com. The boys set up this soccer goal and put out some balls. They kept calling it "Mickey's Mousekercise". I thought that was really cute! Another station was "Mickey's Lagoon". 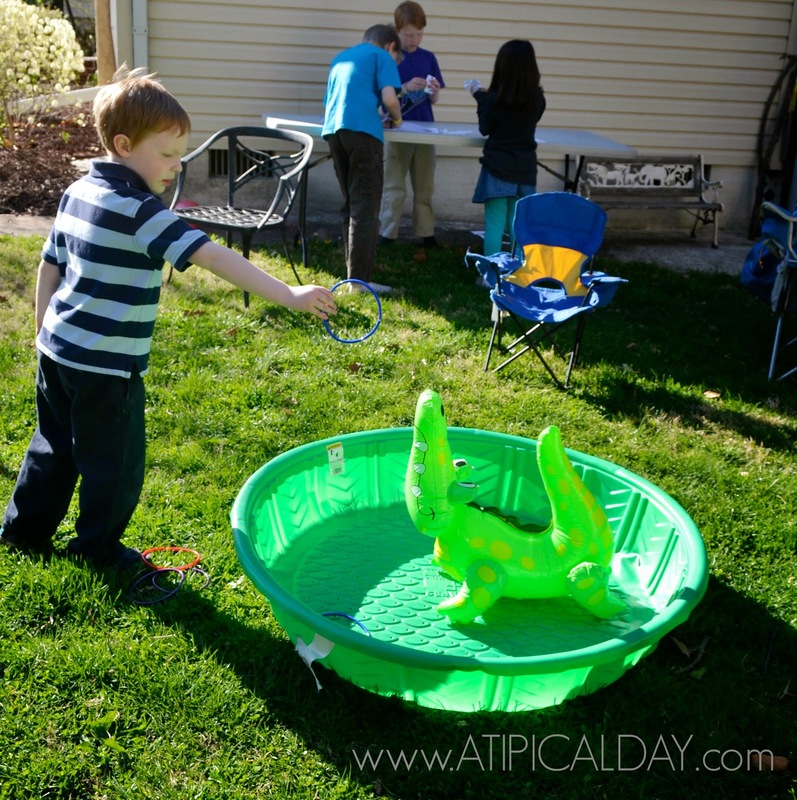 I had an inflatable Alligator leftover from another event and we stuck him in the middle of a kiddie pool. The kids had to throw rings over his nose or tail. I am going to reveal my hidden talent now. I am pretty good at making balloon animals. I figured this out a few months ago when I got volunteered to do them for our Cub Scout Blue & Gold Banquet. Since I have this new found talent, I decided to put it to use and make Mickey Ear hats for the kids. It was pretty windy, so I think most of them lost them in about 5 minutes, but they had fun with them while they lasted. Let me know if your interested, and maybe I will share a tutorial on how to make them. 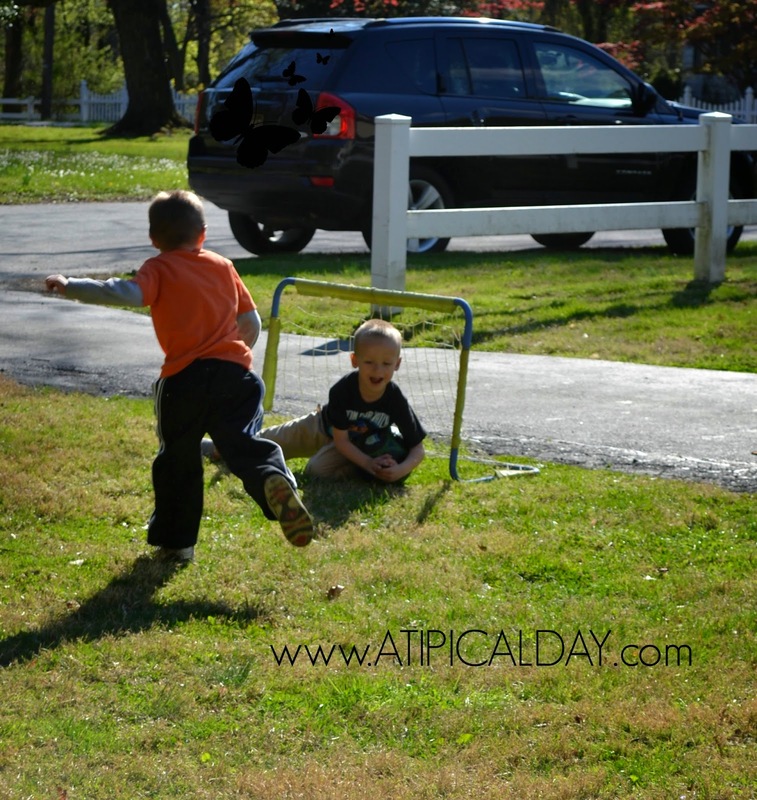 The kids spent a lot of the party just playing in the trampoline. My older boys blew up a bag of dollar store balloons and threw them in the trampoline for everyone to try to pop. They called this game "Donald's Hot Air Balloon Pop". This game went so fast! So we made a second game of picking up all of the balloon pieces. My kids said this was the best part of the party! 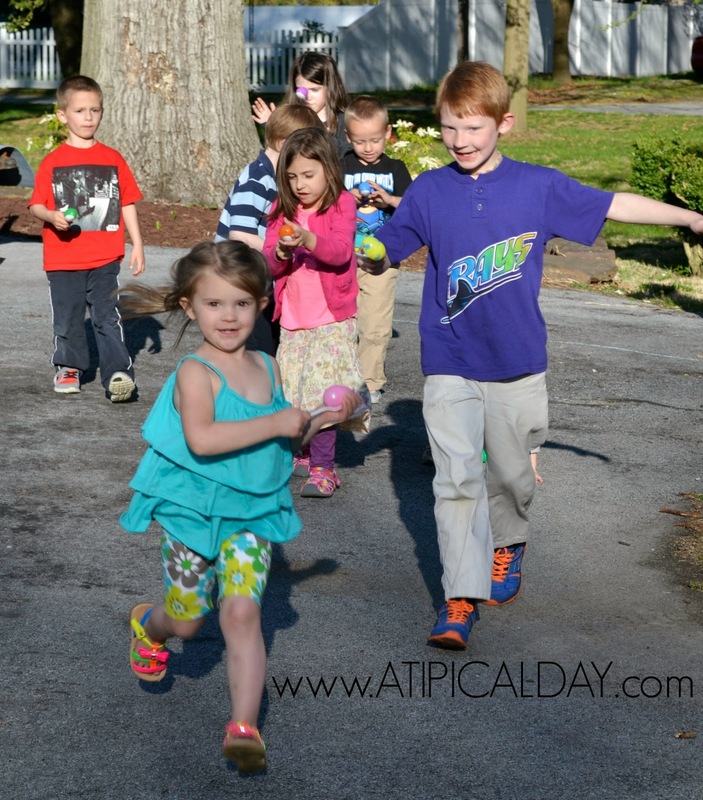 Next up I brought out some plastic spoons and recycled plastic Easter eggs so we could do an old fashion egg race. This was fun, but I am pretty sure every one of these kids cheated! I had to laugh because I've never seen Pumpkin move so fast! Finally we headed over to the pinata. I got the directions for how to make this from At Second Street. It is made from a card board box! 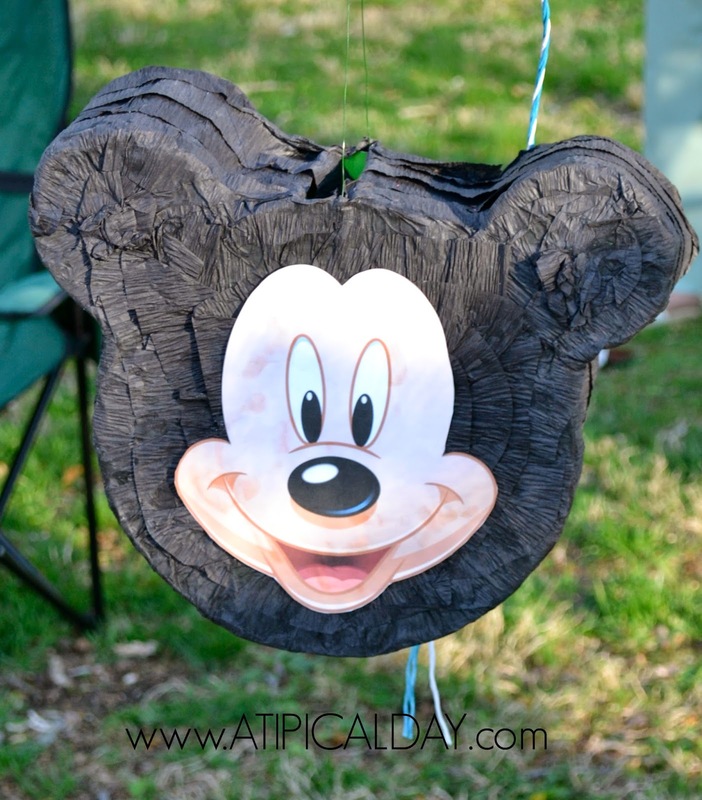 This may have been the easiest pinata I have ever made! I printed out the Mickey face and added it for a finishing touch. I was pretty pleased with how it turned out. In fact, my brother didn't even believe me when I told him I made it! That may have been the best compliment ever! There is my birthday boy sporting his Mickey ears. This total party was really inexpensive. Here is the breakdown of what I actually spent. 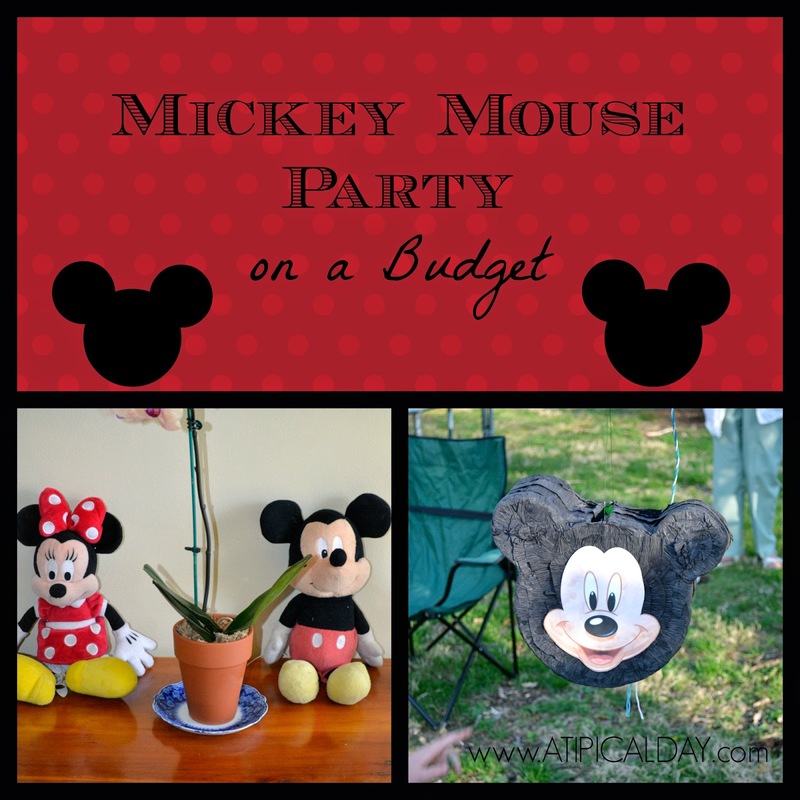 You can find more great Mickey Mouse Party Ideas over on my Mickey Party Board! Tootles! We'll see you real soon! Thanks Nicole! This was a fun one to plan. 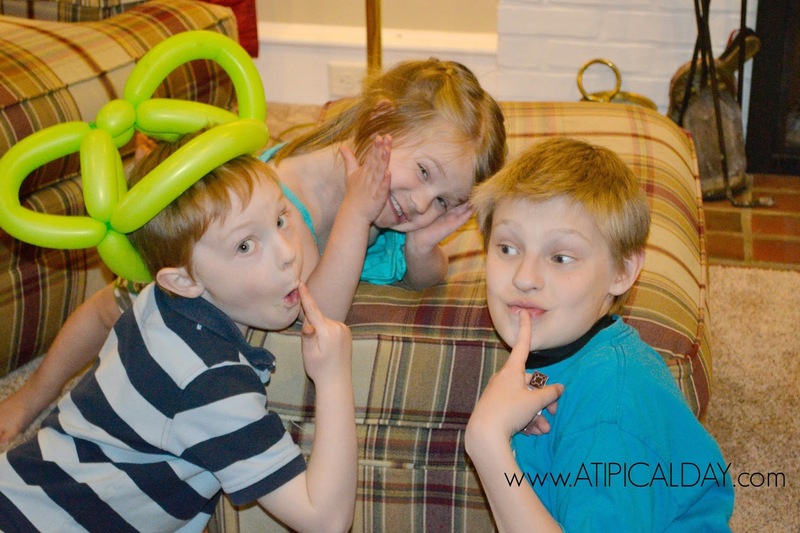 Awesome party with a totally affordable budget! I love the balloon hats and the brown paper bags. WHAT? You made the pinata? I wouldn't have guessed either! This really was a FUN party! Thank you! I'm glad it was so budget-friendly, too. It's the way to go! Yup! I was impressed with the pinata myself! It was by far the easiest one I have ever made too! I heard your little man tell Bud that it was the, "the awesomest party ever!" That really made Bud's day! He is so cute and we really enjoyed having you guys! adorable! Kind of makes me wish I had kids that were still into Mickey! I am sure they will! I have also seen another version where it just used two cookies stuck out the top like ears. Also very cute. 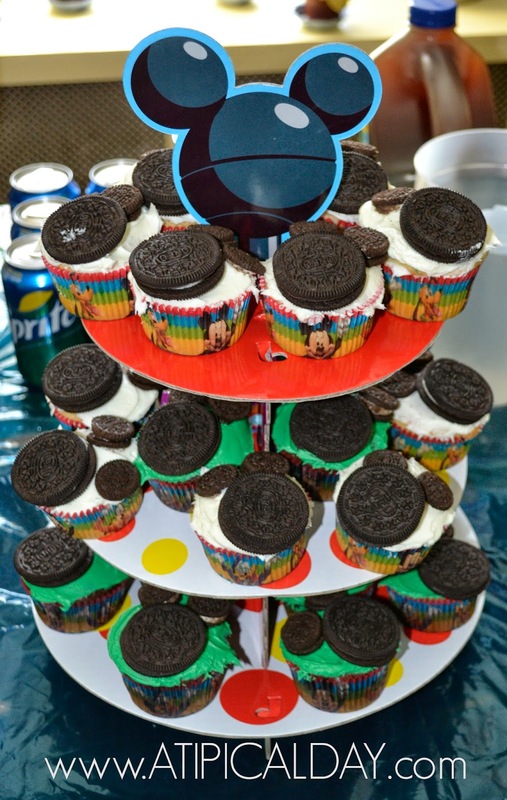 love those cupcakes! so cute! Thanks Angela! I wish could take credit for the idea. I have seen several other places that have done something similar. They were so quick and easy to make though. This is ADORABLE! Love the cupcakes, that you can make balloon animals (!) 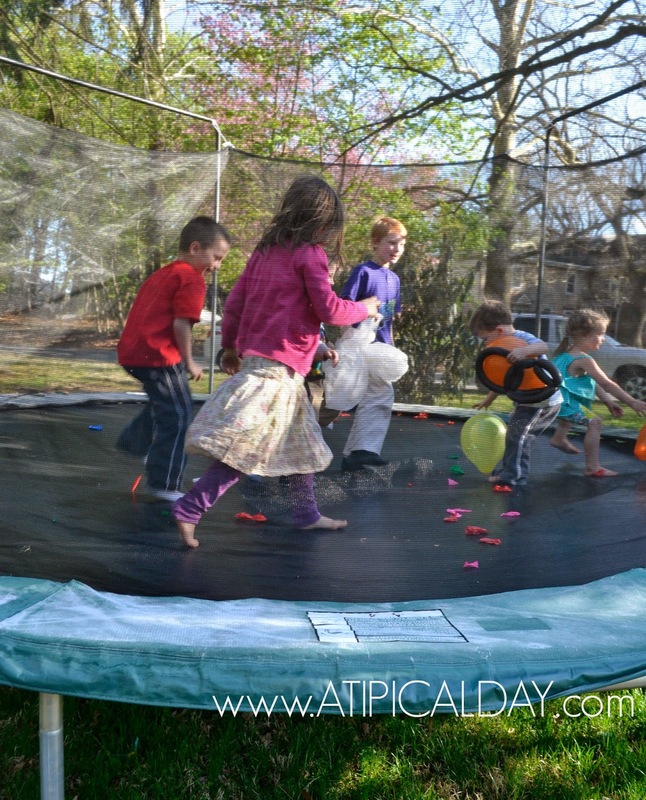 and the balloon pop game in the trampoline!! Stealing that one! Great party! Thank you Karmen. We had such a great day. 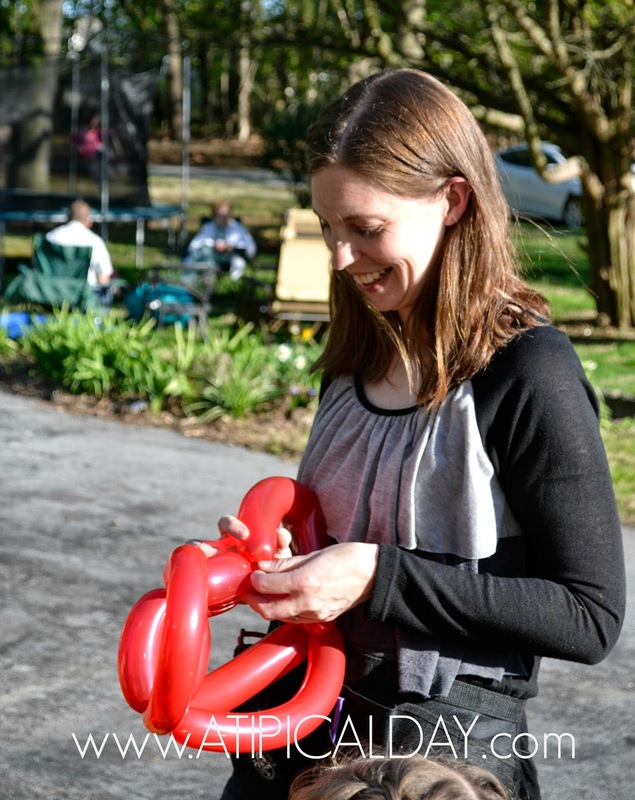 Balloon animals are actually much easier to do than people think. It is just a matter of remembering how to do them that gets tricky! Wow!! I loved everything! The cupcakes were so yummy and fun looking. The day looked like one you all will remember! Great job! Thank you. We really did have a great day. Just glad I had pictures this time! 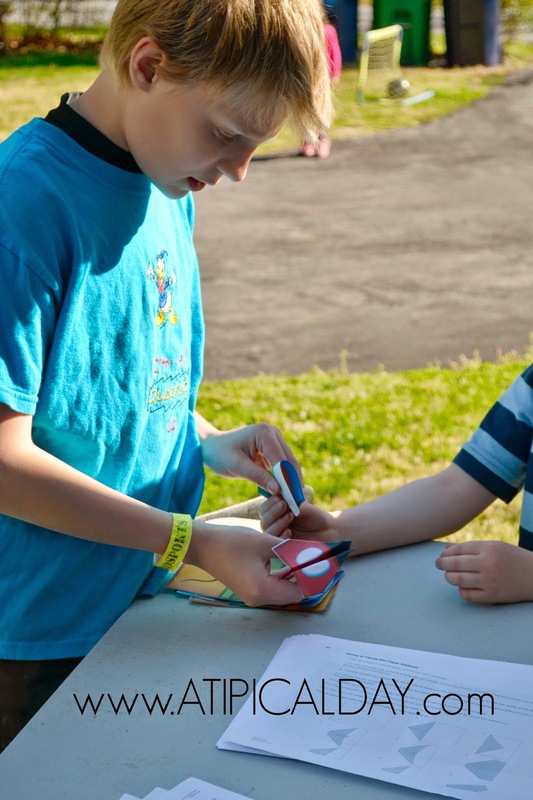 Last summer we did a huge angry birds party and I completely forgot to take any pictures! I was so depressed when the party was over and I realized I hadn't taken any! 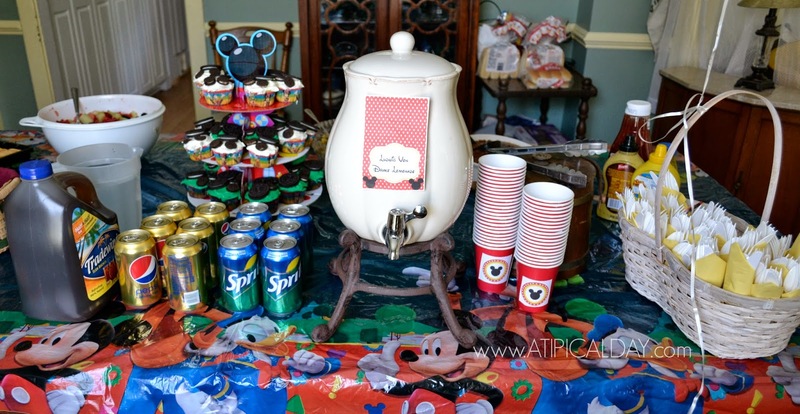 Wish I had known all of this when my Little had her Minnie Mouse party! Super cute! You will just have to throw her another one Krystal! ;) lol. Thanks for the sweet comment. Very cute Meredith. The kids all looks so happy. You are so handy dandy. Thanks Linda for you nice comment. The kids had a blast! This looks like a party I would love! I also love the budget! HAHA yes my husband loved the budget as well. Thanks for your note, Jessica! Thanks for sharing your resources and linking up to Merry Monday. Have a super week.